Welcome to Unreleased Underground. This section is dedicated to the songs that are rare, unreleased, demoed, and are basically hard to find. None of these tracks are found on any main albums, EPs, or compilations. The artists posted here are either signed to Psychopathic or have been signed in the past (for the time being, until more artists and labels are covered). Obviously, it will be near impossible to document a complete vault of rare songs; however, with the help of the community, a solid list can be compiled. The main purpose is to further enhance one’s love for an artist. Once you get into an artist, you want the albums. Then you want the EPs. Then you want the compilations. Then you want the tracks they’re featured on other artists’ albums. Then you want the unreleased songs. That’s where we come in, making an attempt to fully complete your knowledge and collection. Of note is that not all of these tracks are available to download. That’s because either the artist is strongly against the idea of having free music, can currently be purchased in some form, or because a file is currently impossible to find. In addition, not all of the tracks are of best quality. We simply post what is currently available, since it’s better than nothing at all. It’s encouraged to submit any tracks to the site, or possibly information and corrections involving other tracks. This is a group effort with the intent to help everybody out in the end. Unreleased Underground is going to be a work in progress, and it’ll never be fully finished. You can e-mail the staff at OUR CONTACT PAGE or XANARKI directly for questions or submissions. Above each table is the year that a song was initially released and recorded. Also included are the song name(s), the release (if any) that the song appeared on, details covering each song, and a link to the song if possible (links are taken to a separate page with a playlist, since that’s the only way songs can be both streamed and downloaded at the same spot). 2016-12-25: Added one new song by Twiztid. 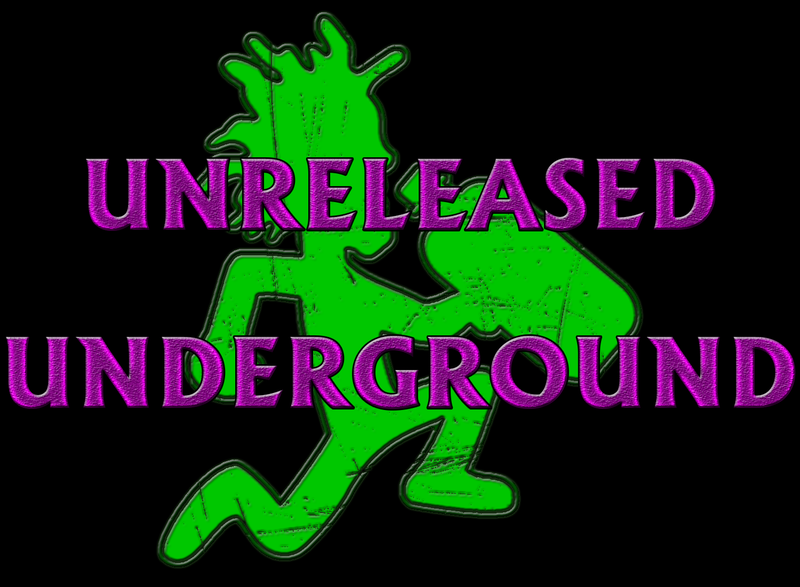 2016-12-10: Added two songs by Insane Clown Posse, two songs by Anybody Killa, and two songs by The Hatchet Family. Removed three songs by Insane Clown Posse and one song by Anybody Killa. Details corrected on the Twiztid, Anybody Killa, The Hatchet Family, and Blaze Ya Dead Homie page as well. 2015-12-13: Added two songs by Anybody Killa, one song by Axe Murder Boyz, eight songs by Insane Clown Posse, one song by Myzery, and four songs by The Hatchet Family. Contributors include jtclarks, the R.Y.E., havoc00, and BZA. Details corrected on the Blaze Ya Dead Homie and Insane Clown Posse page as well. 2015-11-18: The section is online!